If the image and reticle inside of the rifle scope are not on the same focal plane at the same time within the scope, an optical phenomenon called parallax occurs. Parallax will contribute to uncertainty of your shot placement due to the reticle and image not both in focus at the same time and the reticle will appear to move in relationship to the image. Parallax definitely affects your aim and shot placement. To best understand what parallax in a rifle scope is, lets start by actually visualizing parallax. We do this with a quick exercise. Start by holding your right arm straight out in front of you with your hand up and palm facing you (your palm represents the image in the scope). Now place the index finger of your left hand, pointing up about half way between the right palm and your eyes (your finger represents the scope’s reticle). First notice that you cannot focus on both your index finger and the palm at the same time. Now while holding your hands steady, close one eye and move your head back and forth. Notice how the index finger moves in relation to your palm. Although your finger is not moving, it appears to be doing so and this is exactly what is going on inside a rifle scope when parallax is present. 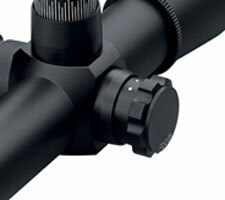 Parallax becomes a problem if the rifle scope has a magnification power range that is above 12x. Under 12x parallax is virtually non-existent as rifle scope manufacturers design scopes with magnification ranges under 12x to be parallax free at 100 yards. Scopes for shotguns may be set to be parallax free at 50 or 60 yards. How do I correct parallax? 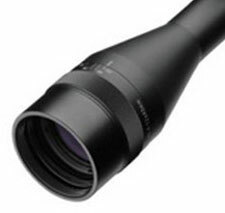 Rifle scopes with magnification ranges above 12x will include either a knob on the left side of the scope to adjust parallax out or the objective bell will have an adjustment for the same purpose. In either case, the adjustment mechanism will move an added lens that is positioned between the objective system and the erector system inside the scope. At some point within the adjustment range the image and reticle will both be in focus. Once you believe that you have adjusted parallax out you can use the steps noted in the exercise above to confirm it. If the reticle moves in relation to the image as you move your head back and forth then parallax is not completely eliminated and you should continue to make finer adjustments. If the reticle does not appear to move against the image then parallax has been corrected. Eliminating parallax will provide you the added confidence that your shot placement will be on target.